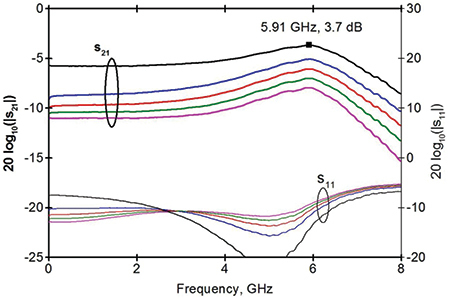 A novel broadband continuous-variable attenuator is presented. Compared with the standard solution, the proposed structure improves precision and linearity, although at the expense of the maximum attenuation range. 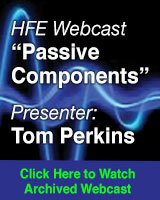 Moreover, the presented circuit is designed considering the RF chain that includes the attenuator itself. Precisely, such a chain typically consists of cascaded amplifiers and passive components: the first (latter) present lower gain (higher loss) as the frequency increases. That produces the typical and well-known (and typically not desired) high frequency roll-off in the response of the RF chain. For that consideration, the proposed circuit is intentionally designed to present the minimum insertion-loss at the highest frequency. An experimental prototype based on very conventional SMD components and one microstrip PCB has been realized and successfully tested, showing the effectiveness of the idea from 10 MHz up to 6 GHz. where R0 is the normalization resistance, and AdB is the required attenuation in dB units. In the following considerations we will assume R0 = 50W, unless differently specified. Figure 1 • Π attenuators: A) Ideal, B) with PIN diodes, C) optimized, D) partialized. RF elements (black) bias elements (green), optimizing RF elements (blue), partializing RF element (red). Figure 1B shows a possible implementation of a continuous variable attenuator based on the Π configuration of figure 1A. Each resistor of figure 1A is replaced by one PIN diode with its associated bias elements. Ideally, the bias elements (green in figures 1B to 1D) should be “transparent” at RF: the capacitors (series RL bipoles) should work as short-circuit (open-circuit). Each PIN diode presents an RF resistance which is strongly dependent (monotonically decreasing) from the DC control current and slightly on the applied RF voltage. 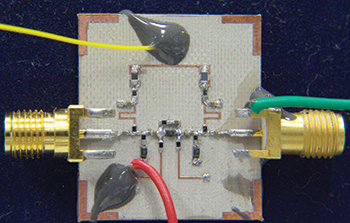 The latter relatively small dependency gives the typical good linearity of PIN diode based attenuators. Unfortunately, at low RF frequencies (comparable with the reciprocal of the PIN diode carrier lifetime) such good effect disappears. Low RF range performance is then a sensitive test for linearity-oriented designs, such as ours. Let us analyze the main limitations associated with the solution of figure 1B, and show the improvements given by the circuits of figure 1C and 1D. Therefore, the series resistance R2 ranges from zero to infinity, while the shunt resistance R1=R3 ranges from open-circuit to R0. 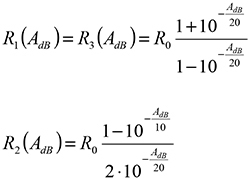 If the specified/required maximum attenuation has a finite value, the upper (lower) limit of R1=R3 (R2) further reduces to a finite value (something smaller than R0). On the other side, PIN diodes exhibit RF resistance monotonically decreasing with the control current, and such resistance assumes all the values from very small (few Ohm typically) to very high (close to open-circuit) ones. Therefore, the circuit in figure 1B does not exploit the complete range of resistance variation in the shunt diodes D1 and D3. This makes the control currents I1 and I3 to be bounded between two finite and nonzero values, instead of between zero and a maximum value. 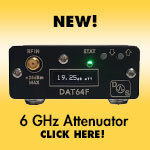 Consequently, the driver becomes more critical and the RF linearity of the attenuator is also compromised. The latter effect can be explained by considering that a diode working with a limited (and narrow) control current range is more prone to self-bias effects due to RF power. Again, if the required minimum attenuation is zero, then the RF maximum resistance of the shunt diodes approaches the open-circuit: the zero-bias region becomes part of the used operating range of the PIN diode. The solution of figure 1C uses a wider driving current range for the shunt diodes than the one in figure 1B. Consequently, the driver design becomes less critical, the self-bias effects are mitigated. The circuit of figure 1C presents higher precision on the RF attenuation and higher linearity (i.e. better P1dB and IP3) than the one of figure 1B. 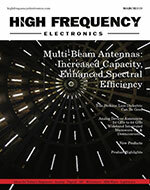 A further improvement of both attenuation precision and linearity can be achieved if the required maximum attenuation is smaller than the one achievable with the available diodes. To make the explanation clearer, we can use some typical numbers. If the required attenuation is bonded between zero and five dB (i.e ), from equations (1) and (2) it follows that ∞ ≤ R1 = R3 ≤ 178.5W and 0 ≤ R2 ≤ 30.4W. The diodes do not use the full available RF resistance range with the already explained consequences on linearity and precision. With the described arrangement, the global RF resistances of the attenuator range between the required finite values although the PIN diode DC currents vary within the full range: from zero to the maximum value specified by the diode manufacturer. The resulting circuit presents therefore low sensitivity to the control current values with the consequent high precision of the RF attenuation and high linearity. An additional good effect of the added fixed resistors R01 to R03 is that they limit the amount of RF energy that invests the PIN diodes: this further reduces the nonlinear RF impedance variation due to the RF energy itself with a consequent improvement on the linearity. Figure 2 shows a photograph of the realized attenuator prototype. The PCB is 22 mm long, including some 50 Ω microstrip lines. One small but important difference is present between the schematic of figure 1D and the photo of figure 2: the bias inductors are not designed to present high (ideally infinite) impedance at RF. Rather; they are short-circuit stubs, λ/4 long at the highest working frequency (i.e. 6 GHz). The combination of those stubs with the respective series bias resistor produce a minimum attenuation (ideally zero) at the highest working frequency, and an increasing attenuation as the frequency becomes lower. Such behavior is intended to compensate the typical high frequency roll-off that is typical for the broadband RF chains (at increasing frequencies, the gain of the amplifiers becomes lower and the attenuation of the passive component becomes higher, as known) that include the proposed variable attenuator. Figure 2 • Photo of the prototype. Figure 3 • Measured linear response of the attenuator prototype. About the linearity: the measured IIP3 is better than 20, 30, 40 dBm at 10 MHz, 100 MHz, 1 GHz, respectively (worst case over the attenuation). Compared with a measured circuit based on the configuration in figure 1B (and using the same bias elements and PIN diodes), the proposed circuit presents an improvement of about 6 dB on IIP3 at 10 and 100 MHz and slightly less at 1 GHz. Giovanni Bianchi (R&D Engineer) received the Laurea degree in Electronic Engineering from the University of Rome “La Sapienza,” Rome, Italy, in 1987. In 1988, he joined the Microwave Department of Elettronica S.p.A. where he was involved in and later responsible for microwave components (including GaAs MMICs) and subassembly design. He joined Motorola PCS in 2000, where he worked on GSM and WCDMA mobile phone design, and in 2004 joined SDS S.r.L. as responsible for microwave designs. Since January 2008 he has worked as an R&D Engineer in the hardware/RF division at Advantest Europe GmbH (formerly Verigy), and is an expert in high frequency theory and techniques. In his 26 years of design experience, he has covered both passive and active microwave components, including filters, amplifiers, oscillators, and synthesizers. He is the author of four books as well as 16 papers. Marco Garbati (Ph.D. Student) received the Laurea degree in Electronic Engineering from the University of Perugia, Italy, in 2013. His dissertation deals with variable attenuator designs and covers the object of the presented paper. He is presently working to achieve his Ph.D. degree. His interests cover analog and digital electronic design, especially those involving high frequency. 1. G. Hiller, “Designing with PIN diodes”, MA-COM Application Note AG-312. 2. R. H. Caverly, “Distortion modeling of PIN diode switches and attenuators”, IEEE MTT-S Symposium Digest, pp. 957–960, 2004.